Tune Hotels is part of the lifestyle business conglomerate Tune Group that was founded by Tan Sri Tony Fernandes and Dato’ Kamarudin Meranun. Tune Group seeks to innovate and revolutionise the way services are made available and has employed efficient web-based technologies to reach and engage its customers, presenting a unique lifestyle offering ranging from value hotel stays, personal finance solutions and affordable prepaid mobile services. Tune Group of Companies are Tune Air, Tune Hotels, Tune Money, Tune Talk, Tune Box, Tune Studios, Tune Live and, Queens Park Rangers Football Club (QPR). 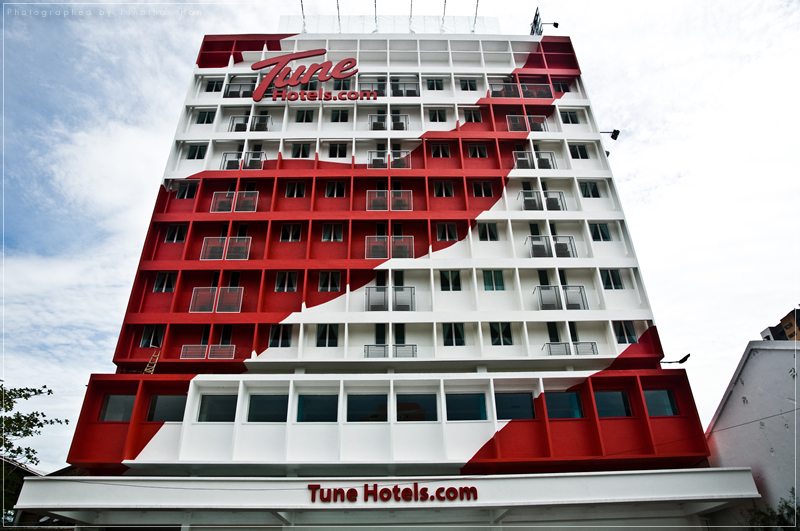 Since Tune Hotels was first launched in Kuala Lumpur, Malaysia, in 2007, over 3 million guests have stayed in its properties spread across Malaysia, Indonesia and the United Kingdom. It now has 14 hotels located in Kuala Lumpur, Kota Kinabalu, Kuching, KLIA-LCCT Airport, Penang, Johor Bahru, Kota Damansara, Bintulu, Kota Bharu and Kulim in Malaysia; Kuta and Legian in Bali, Indonesia; Westminster and Liverpool Street in London, England; and Hat Yai in Thailand. All Tune Hotels feature space-efficient, streamlined rooms focusing on high-quality basics: 5-star bed, powerful hot showers and energy-saving fans. The strategically located hotels provide housekeeping services, electronic keycard access into rooms, CCTV surveillance, and prohibits access into the main lobby without a keycard past midnight. Through Tune Hotels’ pay-as-you-use system of add-on WiFi, TV, laundered towels and other energy-consuming facilities and amenities, Tune Hotels aims to help guests conserve both their funds as well as the earth’s resources. Tune Hotels is a part of Tune Group, the principal partner of the Premier League’s Professional Games Match Officials (PGMO) & the BIG Global Loyalty Programme. More photos are available from www.flickr.com/tunehotels. Tune Hotels was last year ranked ninth among the Top 20 Innovative Brands 2011 in Indonesia by MIX magazine, a leading marketing communications magazine. Tune Hotels was the only hotel brand on the list, alongside global leading brands such as BlackBerry, Tupperware, Nissan, 7-Eleven and Pizza Hut. Kicking off Tune Hotels’ list of accolades for 2012 was the Most Promising Brand award that it received from the Asia Pacific Brands Foundation at the Brand Laureate - SMEs Best Brands Awards 2011 in Kuala Lumpur recently. Tune Hotels has received over three million guests since the opening of its first hotel in downtown Kuala Lumpur in 2007. Tune Hotels currently operates 15 hotels in Malaysia, Indonesia, the UK and Thailand, with another 30 hotels scheduled for opening this year in the Philippines, Thailand, Indonesia and the UK. Tune Hotels has successfully pioneered a branded value hotel brand with the concept of pay-as-you-use that has become hugely popular amongst travelers from across the world. Under the concept, guests only pay for room rates with the option of adding on other amenities like towels & toiletries, air-conditioning, in-room wifi and satellite TV service at selected hotels. Apart from enjoying great value, great savings at Tune Hotels, guests can also enhance their benefits and privileges by becoming a member of the BIG loyalty programme, of which Tune Hotels is a partner. BIG is a global loyalty programme that allows card members to accumulate points when travelling and shopping with BIG partners worldwide, and redeem the accumulated points for exciting rewards including flight seats on the world’s best low cost carrier, AirAsia. More information on BIG is available at www.tune2big.com. For booking and further information, visit www.tunehotels.com.